Nothing too serious here...just a few of the many pictures taken (so far) during the 2014 Christmas season. 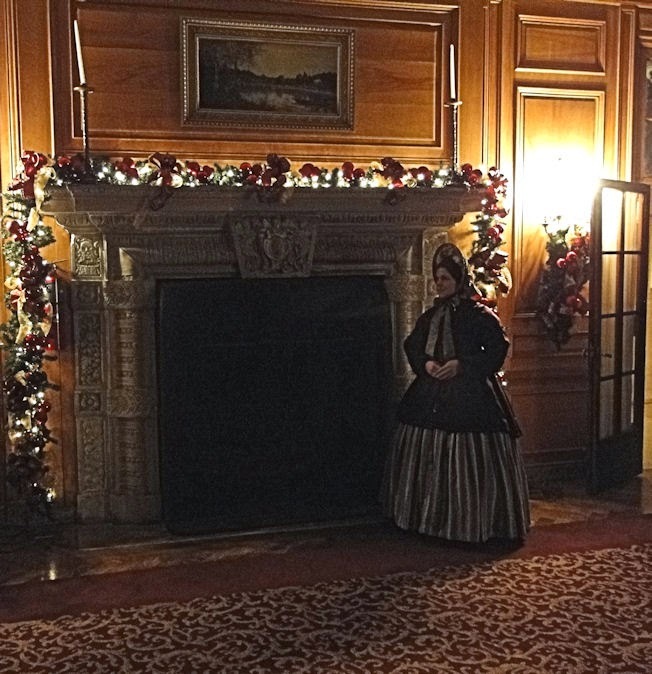 Between performing with my period vocal group, Simply Dickens, and visiting Greenfield Village during Holiday Nights, I have plenty of photos that depict Christmas past. 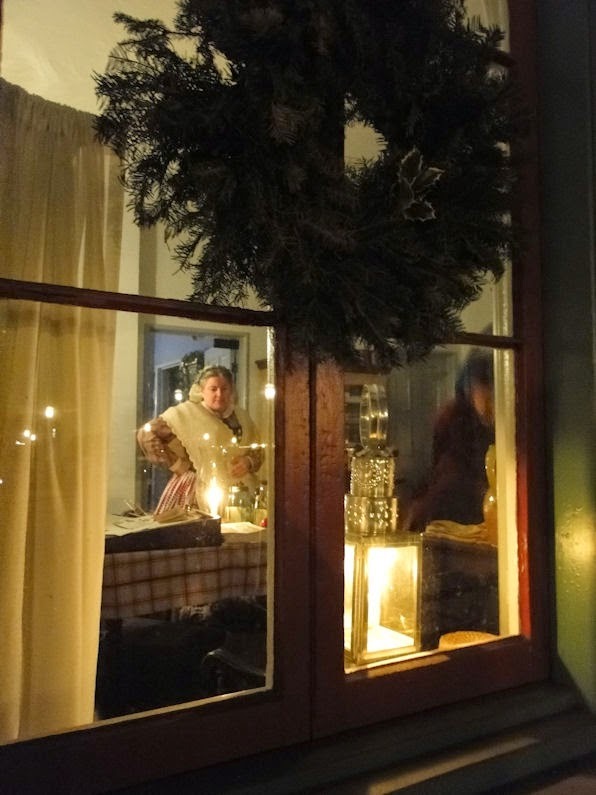 Then there were the living history excursions earlier in the month (click HERE, HERE, and HERE) that began my Christmas past travels. 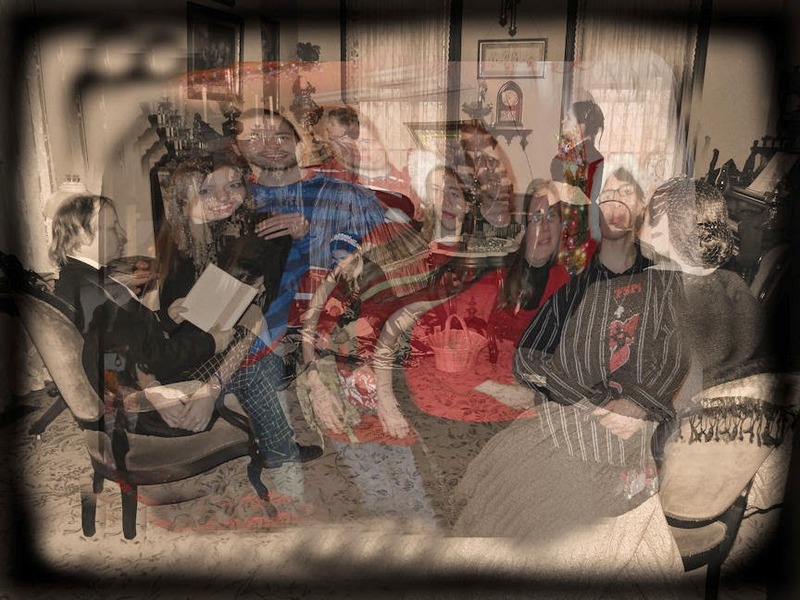 I suppose for you to understand how this whole time-travel thing works for me, we'll have to paraphrase my favorite author, Charles Dickens, from my favorite book "A Christmas Carol:"
"Are you the Spirit, sir, whose coming was foretold to me?" asked Ken. "Who, and what are you?" Ken demanded. "Long Past?" inquired Ken: observant of its dwarfish stature. As the words were spoken, they passed through the wall, and stood upon an open country road, with fields on either hand. The 21st century had entirely vanished. Not a vestige of it was to be seen. The computers & televisions, cell phones & iphones, and automobiles & jet planes had vanished with it, for it was a clear, cold, winter day, with snow upon the ground. "Good Heaven!" said Ken, clasping his hands together, as he looked about him. 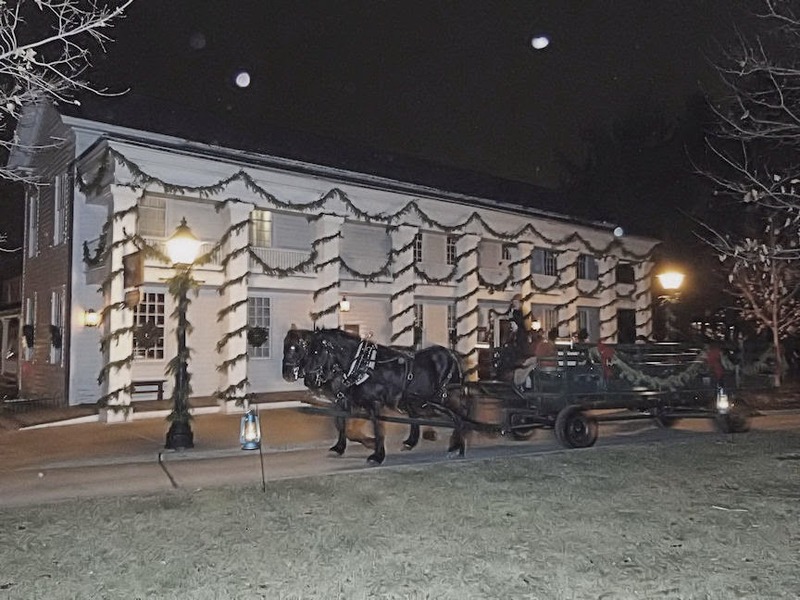 "This could be Greenfield Village or Historic Fort Wayne! I was practically bred in this place." The Spirit gazed upon him mildly. Its gentle touch, though it had been light and instantaneous, appeared still present to Ken’s sense of feeling. He was conscious of a thousand odors floating in the air, each one connected with a thousand thoughts, and hopes, and joys, and cares of long, long, ago. Ken, with an unusual catching in his voice, that it was a pimple; and begged the Ghost to lead him where he would. "Are you prepared?" inquired the Spirit. "Prepared!" cried Ken with fervor -- "This is my dream come true! I’ve researched history my entire life, and to now be immersed in the past - I must be in heaven, man!" They walked along the road, Ken recognizing the social history he loved so much…every vestige; until a little market-town appeared in the distance, with its bridge, its church, and winding river. Some shaggy ponies now were seen trotting towards them with boys upon their backs, who called to other boys in country gigs and carts, driven by farmers. All these boys were in great spirits, and shouted to each other, until the broad fields were so full of merry music, that the crisp air laughed to hear it. Yes...this is kinda how I feel during nearly every reenactment I participate in. But it's at Christmas time that a certain special kind of magic overcomes me as well as the other living historians who enjoy bringing the times past back to life, for it is at this festive season when, except for the Scrooges of our society who feel that Christmas truly is nothing but a humbug, folks seem to smile a bit more often, will greet folks with a jolly "Merry Christmas!" and tend to open their hearts a little wider. Or is this one of my little fantasies or psychological mind travels away from the realities of modern society? Well, if you think of me in this manner then I suggest you "come in and know me better, man!" For I try to be upbeat and look to the brighter side of life year 'round, though even more so at Christmas. Why more so at Christmas? Because I have found that I can actually happily greet folks and they will, in return, usually respond in the same manner without thinking it's weird or strange. This doesn't generally happen nearly as often at other times of the year, however. Plus, just the whole festive feel of it all...the most wonderful time of the year is right! 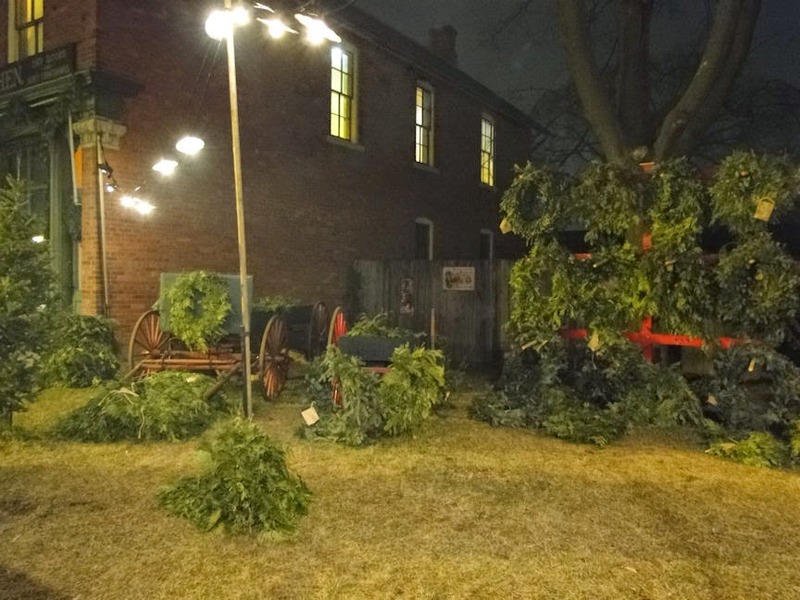 So let's take another journey through Christmas past - what follows are pictures of Christmas 2014: the middle weeks, taken at various locations throughout this season, though mainly at Greenfield Village. Not the Village green, but the greens of Greenfield Village! 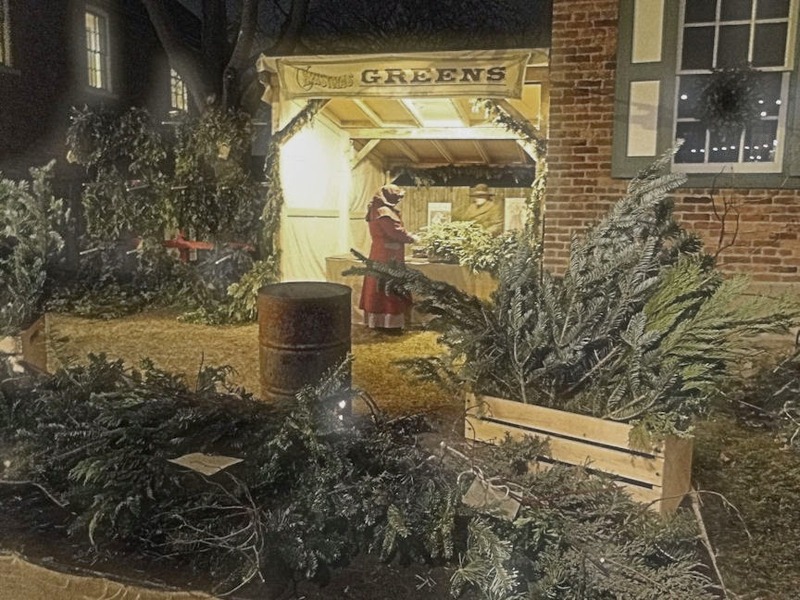 You can purchase all sorts of real Christmas greenery during the Holiday Nights event. Here is another photo of the greens being sold. I liked the look of the merchant standing in the lean-to. Tom keeps the fire plenty hot for folks wanting to warm their nose and toes. My wife participating in the Soldiers Aid Society presentation at the Smiths Creek Depot. This is her third year (maybe fourth) doing this and she really enjoys it quite a bit. I could see her as a permanent presenter at the Village - yes, she's that good! The Eagle Tavern is my very favorite restaurant. 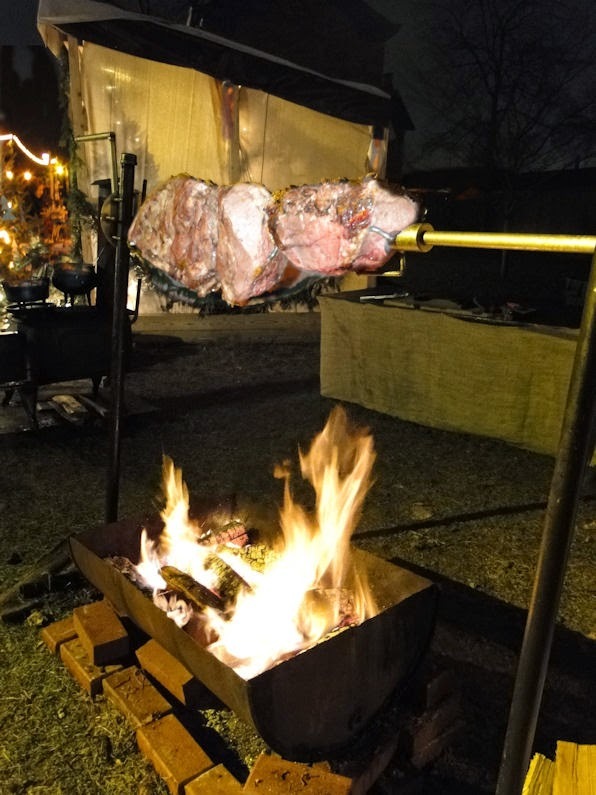 Not only is the food period correct (as much as the modern rules will allow), but the atmosphere cannot be beat! 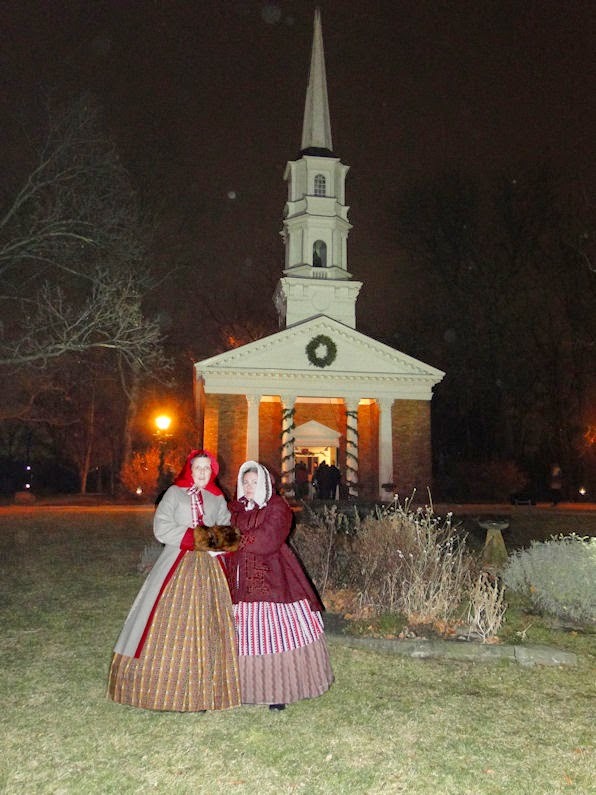 Toward the end of the evening, many of the participants line up, lanterns in hand, and, as a drum beats, a fife plays, and bells toll, they will walk across the Village green from the church to the Town Hall where a Christmas carol sing-a-long and a fireworks display will take place. My wife (on the right) and her partner in crime, Lorna, work very well together as part of the Ladies Aid Society. 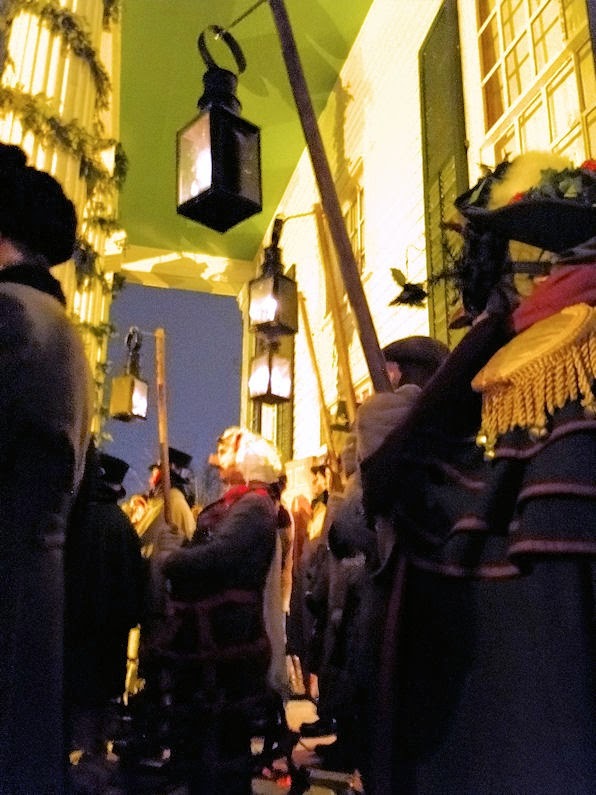 On this night they were asked to be a part of the Village Green procession, which they gladly accepted. 21st Michigan and Simply Dickens member, Beckie, contemplates on whether she should cross the green or not. 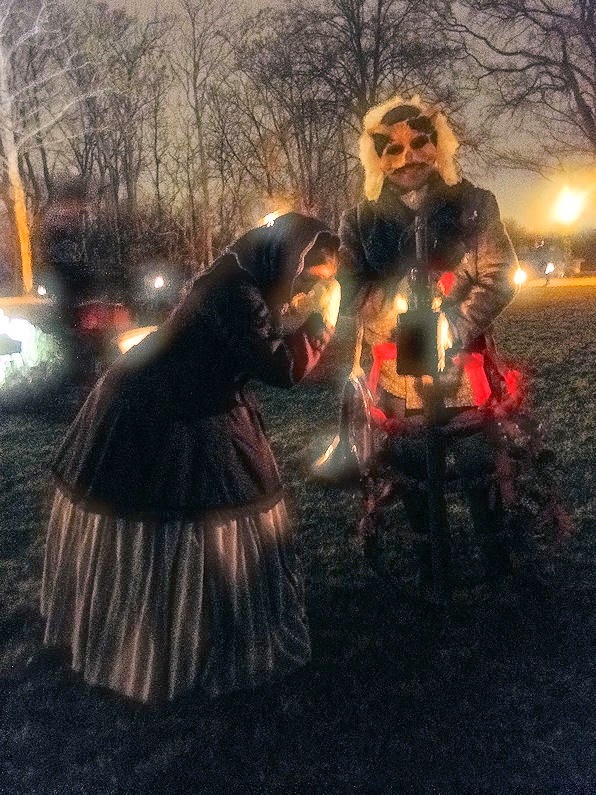 The mummer next to her may be able to convince her where others may not. The lantern, the tavern, and thou. At Town Hall, the singing commences! See the mummers? Yeah, watch out for them, for they are quite a group of merry pranksters! 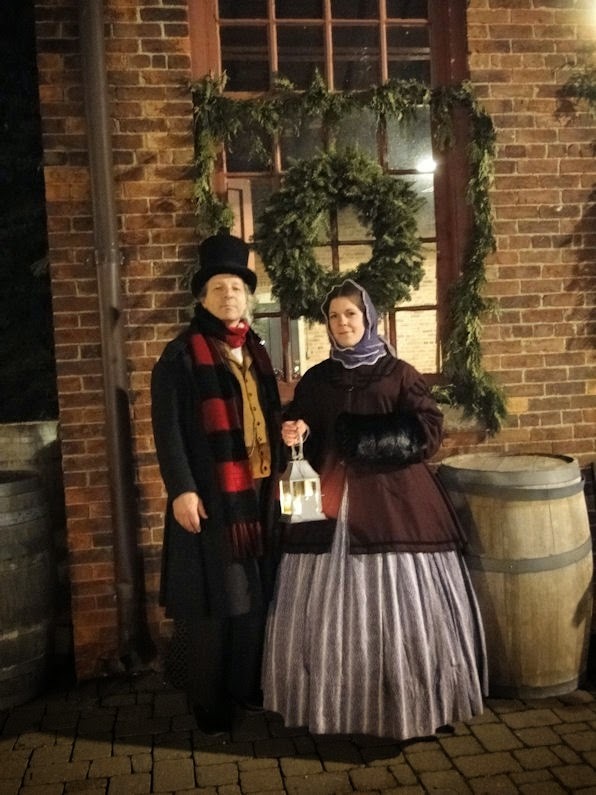 Here's my group - Simply Dickens - performing at Greenfield Village near the craft store. 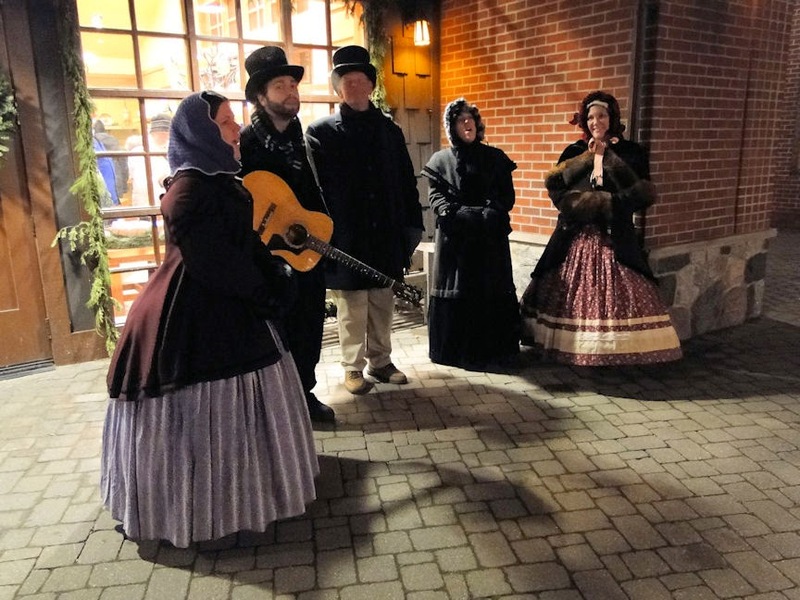 We so enjoy being a part of Holiday Nights; the visitors are usually very much into Christmas and quite a crowd will gather 'round to hear our music. 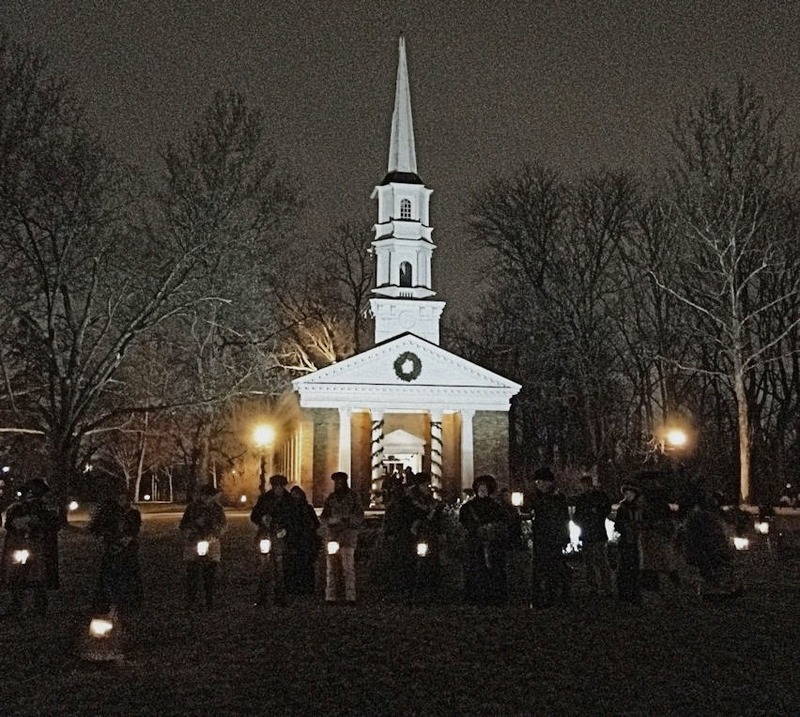 We like to think we give them a good bang for their buck by singing the old world Christmas Carols one does not hear too often such as The Gloucestershire Wassail and The Boar's Head Carol, among many others. Beckie and I with her new lantern. I’ve been slowly trying to collect a series of water-color prints of four different structures located inside Greenfield Village. I received my first one last year for Christmas (of the Daggett Farm) and had been searching for the print of Firestone Farm. I put the word out on my Friends of Greenfield Village Facebook page, and a very kind person, who just so happened to be a volunteer there, had an extra copy in her collection. When I asked for a price, she stated that rather than give her money for it she would like me to, instead, purchase a lantern from the Village store to give to our mutual friend Rebecca. Rebecca is not only one of the awesome vocalists in Simply Dickens, but she is also a member of the civilian contingency of the 21st Michigan Civil War reenactors. The look on her face when I gave it to her after the purchase was priceless - - - she had a look of "Really? I'm confused? Really? Why? I'm confused!" As this whole set up was devised in secret, that's where it shall stay, and poor Beckie still has not figured out who the perpetrator of the original idea was. Yeah...Christmas certainly is a grand time! 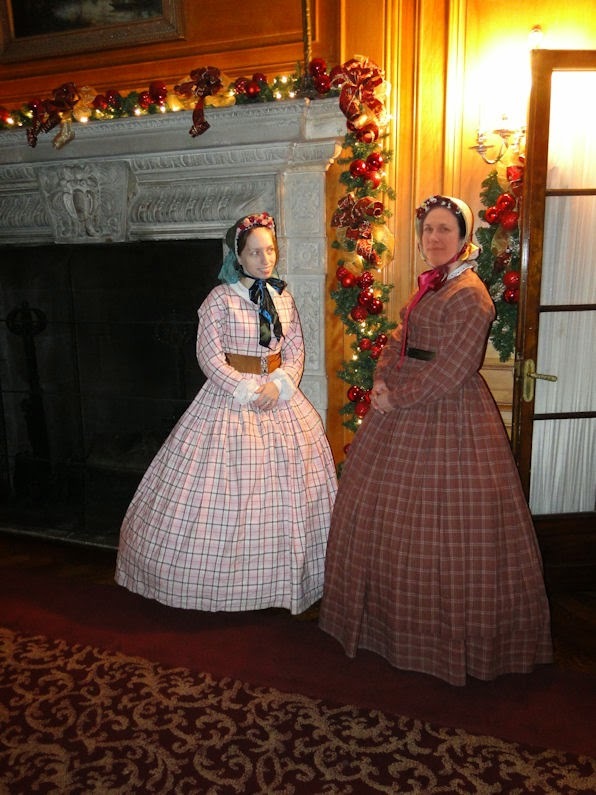 Speaking of having a grand time, Simply Dickens was contracted to perform at a Christmas Tea for the Louisa St. Clair Chapter NSDAR (Daughters of the American Revolution). 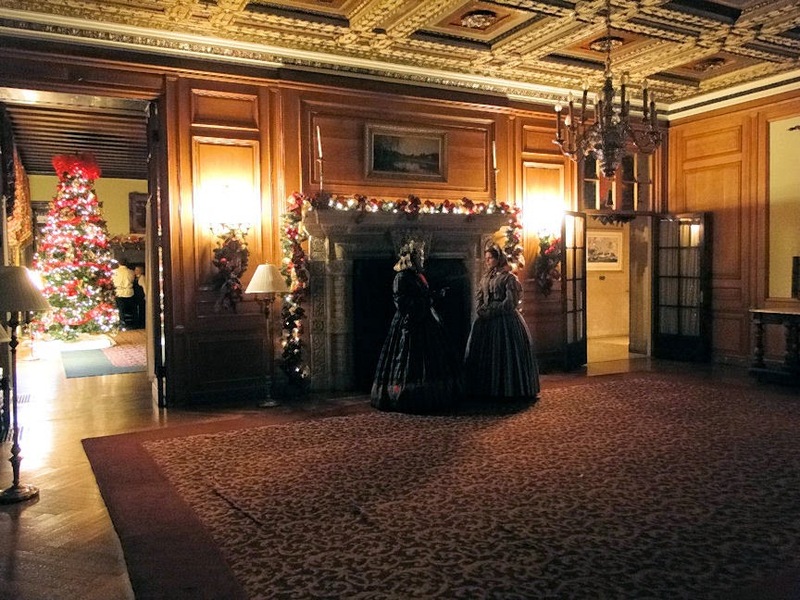 This took place at the beautiful circa 1910 Grosse Pointe War Memorial located in upscale Grosse Pointe, Michigan. 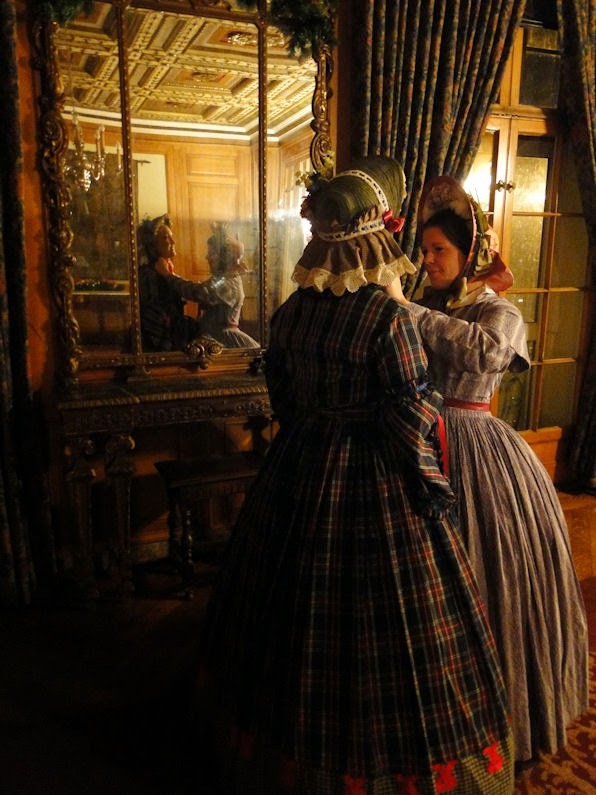 As other members of our group was still getting ready for our performance, I took the opportunity to pose Beckie and Diana in the beautiful room we were in. Here Beckie is standing by herself, looking lonely. Come on out, Diana! "Okay girls, act natural. 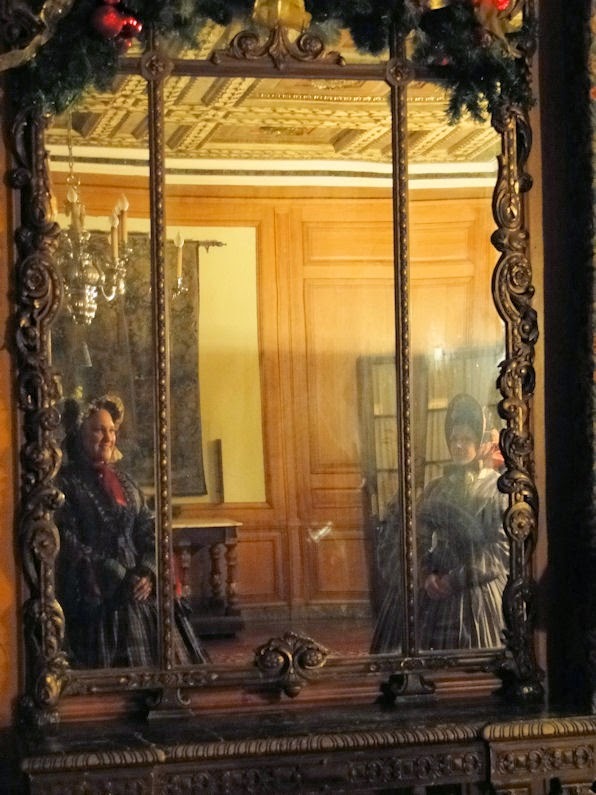 Act like two Victorian ladies having a conversation. Good...okay...yep - got it! Thanks!" "Let me fix the ribbon on your bonnet, Diana! Sheez! You'd think for an art teacher you could tie a proper bow!" Sometimes ideas for pictures happen just by looking UP! That's how this picture came about. 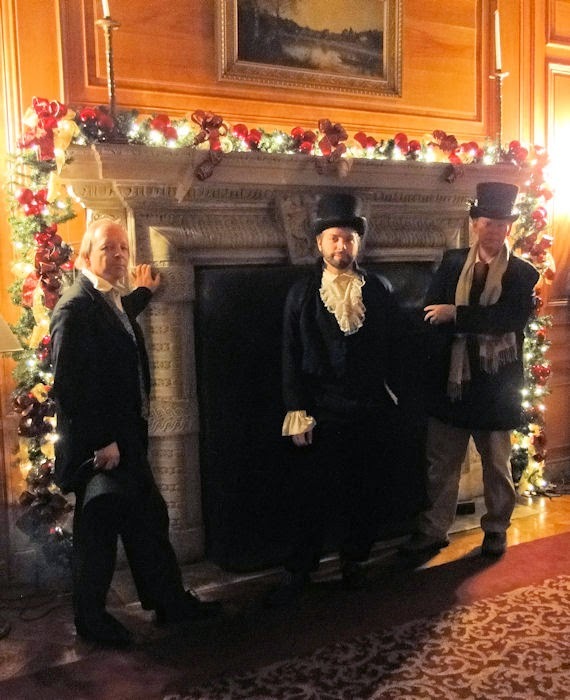 The men of Simply Dickens; the Dickens you say! Me, my son, and TC (far right). See the young lady on the left? That's my daughter-in-law. See the young lady on the right? Another good friend! Both have beautiful voices - Simply Dickens is one awesome group to have all the great vocalists it does! And here we have my home. Actually, a room in my home. The fire in the fireplace is not real. 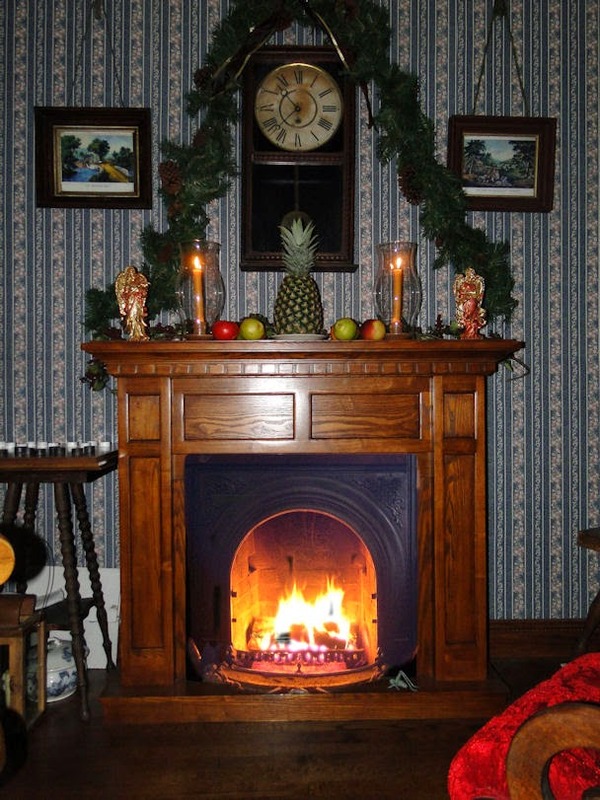 I mean, it's real, but not really here - it's actually taken from a photo I took of the fireplace at Firestone farm. One can work wonders with Paint Shop Pro. Also, the fruit on the fireplace is not period correct. Folks from the past would not have wasted fruit as decorations. They'd have eaten it. Fruit was pretty hard to come by here in the north in December. But the cricket on the hearth is not only period correct (according to Charles Dickens), but is really there! Except it's not real. But I love it just the same! Something else that's not real: Ken in modern clothing. 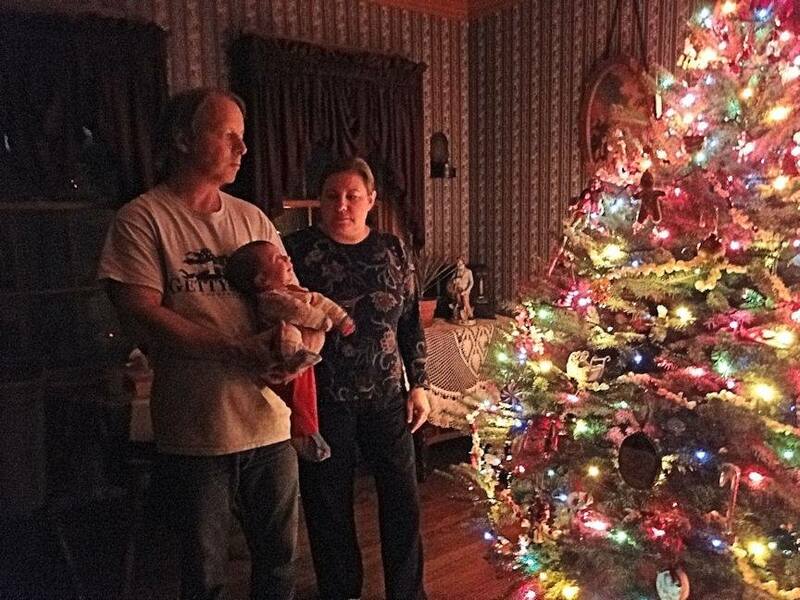 W-e-l-l...the expression on my grandson's face as he gazes in awe at his first-ever look at a lit-up Christmas Tree should overshadow any deformity in my attire. Having my grandbaby Benjamin around is certainly a treasure for us. Sometimes I have to do a double take to realize that I'm holding my GRANDson! You know what this means, right? Yep - I am hoping to take him with me on a warm day next spring to visit Greenfield Village. 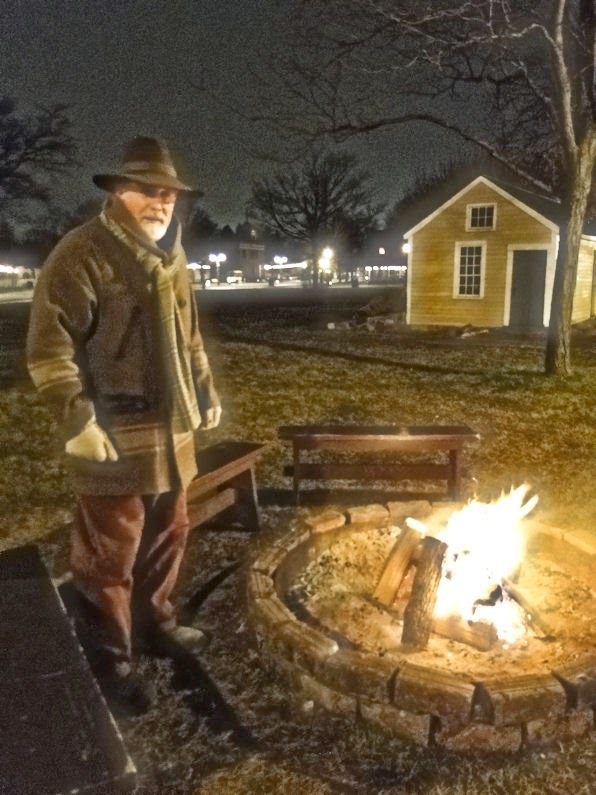 I also have my mind set on having him participate in his first reenactment over Memorial Weekend, again at Greenfield Village. Life goes on. When I hold Benjamin I feel like I am holding the future of the past in my arms. I liked your story about the lantern and how you pulled that one off. Nice photo of you two holding the lantern on a beautiful brick walkway too. That fireplace in that 1910 building is huge! Just beautiful! Thanks for sharing a bit of the past in the present with us and Happy Christmas to you and yours! Thank you so much for such a kind comment Gina! A Merry Christmas and a Bless'd New Year to you! Love the way you explain how the Christmas sentiment crosses the time barrier from past to present visitors. When stuck on a conversation, this is it. BTW, I am confused what Becky meant by "cross the green". 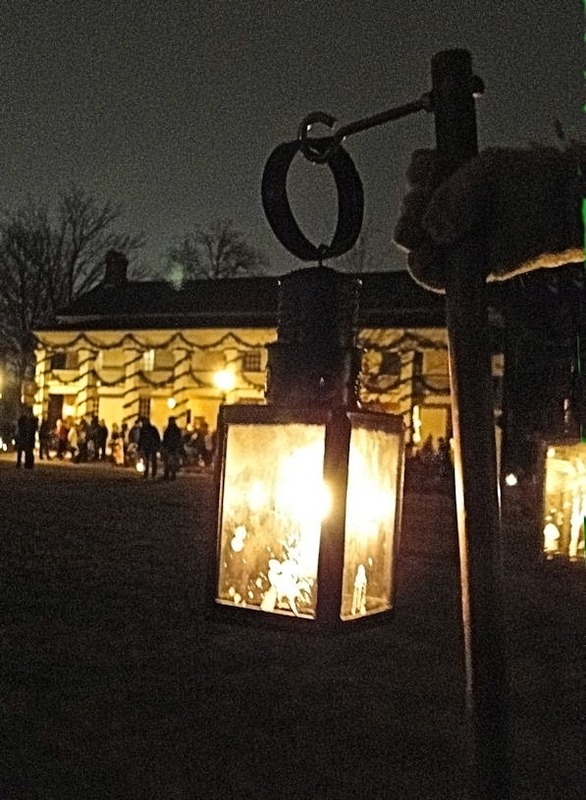 "Crossing the green" is when many of the participants at Holiday Nights will take up lanterns, bells, drums, penny whistles, etc., and cross the village green from one end (near the church) to the other (town hall) while the visitors/customers watch along the sidelines. Once we get to the town hall carols are sung followed by a wonderful fireworks display. Hope this helps - - thank you for the kind words!